Guys – big news! 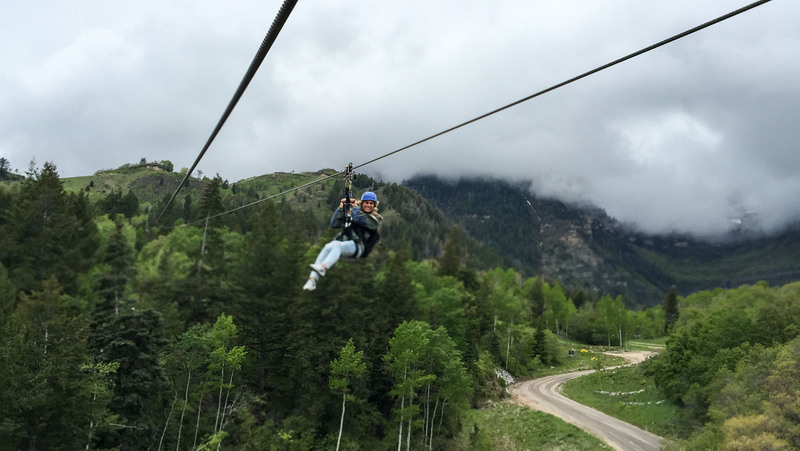 Sundance Resort in Utah is about to open something really amazing – a zip line tour up and down the mountain! 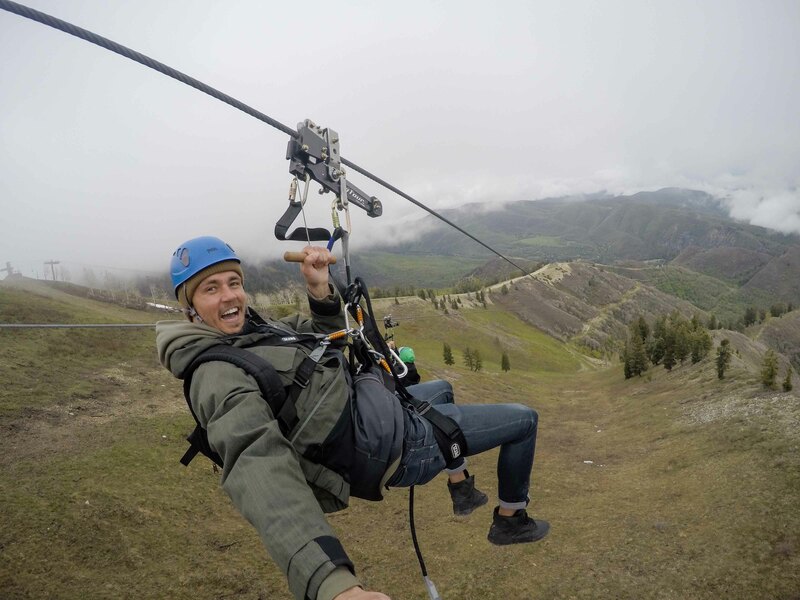 We recently had the opportunity as a family (the Nyman side) to test out the new ZipTour at Sundance Resort and ohhhh my goodness – it was unreal. The whole experience was magic. Utah has been having some crazy storms, so we weren’t sure if the weather would stop us from going. We all kind of held our breath the morning of, waiting to see if it was a go, and I was so excited when we got the “ok” to head up the mountain. We put our gear on at the base of the mountain, which included harnesses, helmets, and a backpack with our “trolley” in it. This is the device they hook to the zipline that takes you down. It was actually raining lightly (they can run the lift/ziplines in the rain – just not in thunder/lightening or excessive wind) and we joked that it felt like we were in Ireland. Everything was covered in a layer of mist and so vibrantly green, and as we took the chairlift up the mountain we literally rode up into the low-hanging clouds. This marked the first time I’ve been in a cloud, other than on an airplane, and it was pretty surreal! And a little cold ;). 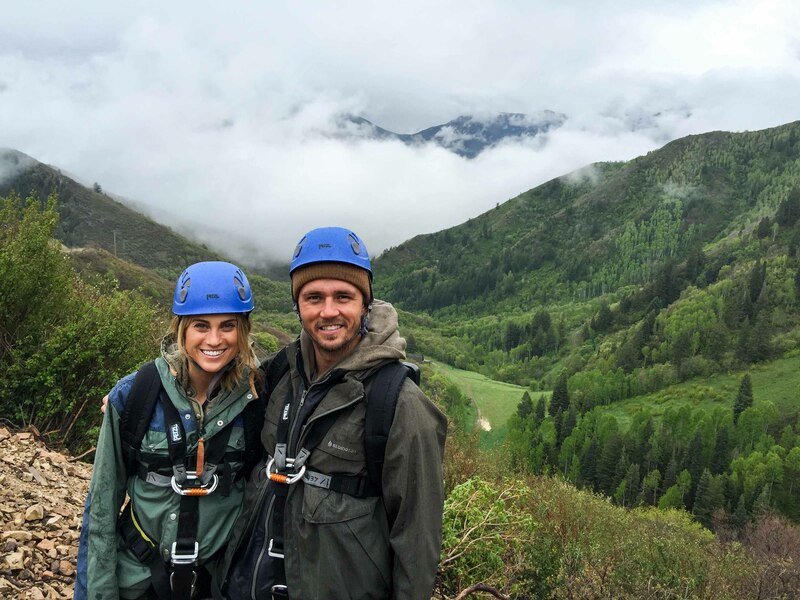 You get to go all the way to the “back mountain,” and one of the ziplines launches all the way up top near Bearclaw Cabin (which happens to be where Blake and I got married last year, so of course we had to take a picture even though we were in the middle of a cloud!) 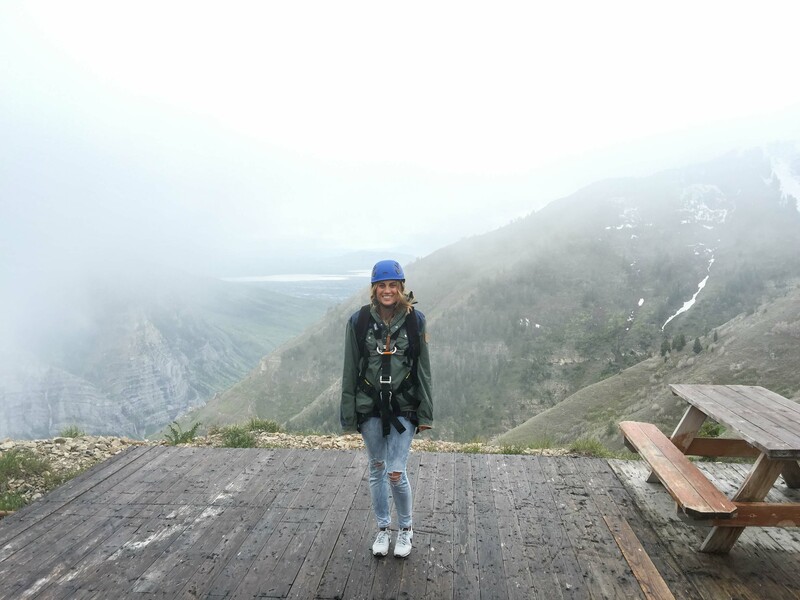 They told us that this summer even Bearclaw will be open, so it will be cool to be able to grab snacks and drinks and enjoy the view while you’re up there. Before taking on the bigger ziplines (there are four in total!) we got to do a little practice run on a smaller line. This was fun in itself, but also gets you used to how the braking mechanism works. Yes – you have brakes! The staff running the ZipTour are so friendly and knowledgeable, and we had such a good time with them. Each zip line is a little different, and I loved that you can kind of customize your experience to what you want. I also love that we could go side-by-side, at the same time. It’s so fun to experience together! On one of the lines Blake and I stopped in the middle, just to enjoy the moment and the view, and to look down and realize how high we actually were! And on the last line, we decided to let loose and fly. Since you’re closer to the trees, you really get a cool perspective on how fast you’re going. We’ve heard they’ve clocked speeds at over 70mph on that line! 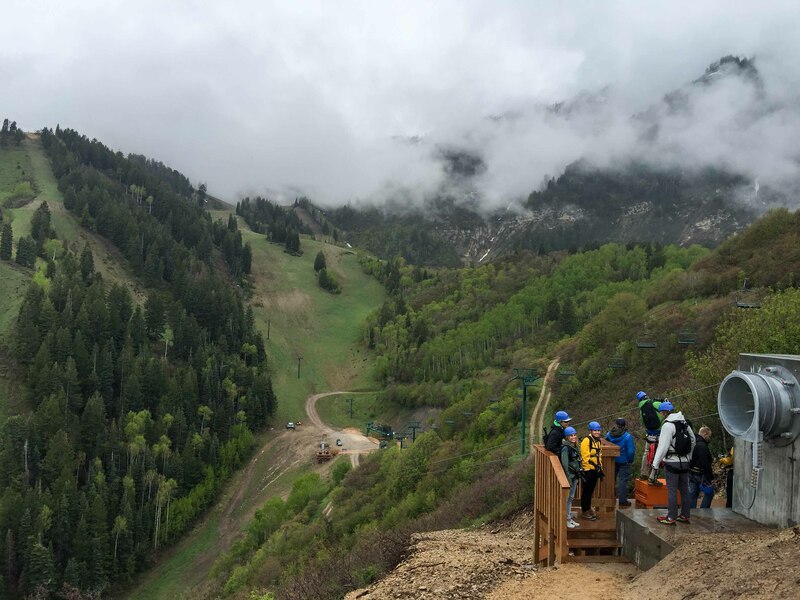 We felt super lucky that Sundance invited us to try the ZipTour before opening it to the public. But the best news is we have a promo code for you to go experience it, as well!! 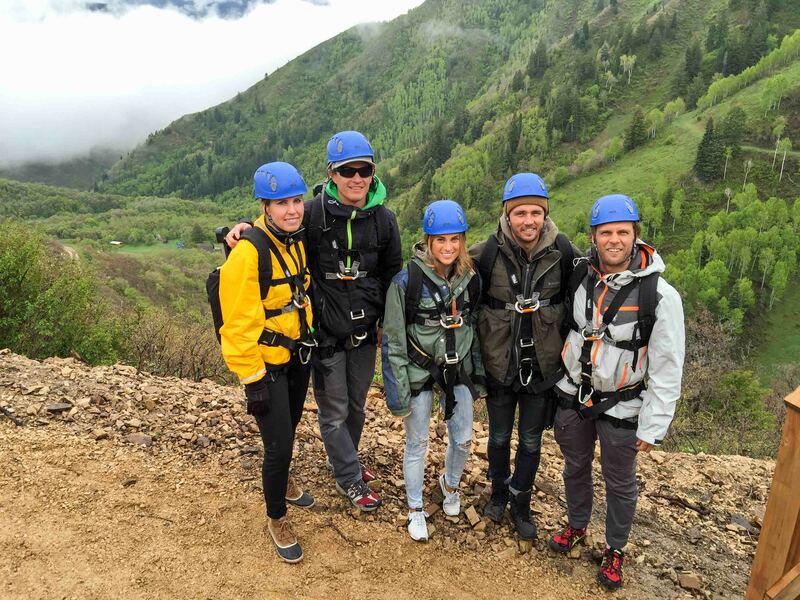 For reservations, head to www.sundanceresort.com/ziptour or call 844-ZIP-TOUR – and use NYMAN20 (be sure to use all caps) for 20% off! A few things to keep in mind – the entire tour can take a little over 3 hours, so you’ll want to make a day of it. Check the weather in case you need to dress warm, and keep in mind that the top of the mountain will be significantly cooler. Also, make your reservation online and you can fill out your waiver beforehand to make it easy when you arrive. All in all, it was an amazing experience – a day for the books! To be honest, the ZipTour exceeded my expectations, and I’d do it again and again. Thank you so much to our friends at Sundance for an amazing experience! Sundance Mountain Resort Zip Tour from Blake Nyman on Vimeo.